Welcome to a select group of racers participating in the fastest form of competition on two wheels: WERA Motorcycle Roadracing. Get ready for one of the greatest experiences of your life-safely using all the power and handling your machine was designed with, without worrying about speeding tickets, traffic hazards, pedestrians, erratic or drunk drivers or any of the other nagging realities of today’s street world. Your membership benefits include limited excess accident insurance (while racing), discounts on products and services at participating shops and businesses, plus other available programs and awards. WERA policies, rules and class formulas have been formulated with fair and equal competition as our goal. While WERA welcomes participation by contingency program and race team sponsors, WERA management is independent and makes decisions based on fairness for all and the well-being of our sport. WERA takes pride in its role as America’s premier National organization devoted exclusively to the advancement, operation and sanctioning of motorcycle roadracing. Since its establishment in 1973, WERA has established roadracing in many parts of the country where no viable program previously existed and has maintained an unparalleled safety record. WERA will continue to maintain its presence in all parts of the continent as North America’s Roadracing Leader. These rules are made available to any individual. Compliance with these rules is the responsibility of each racer. Enforcement of these rules is the responsibility of each race’s designated officials. These WERA rules are written to insure that all riders have the opportunity to compete impartially and as safely as possible in motorcycle roadracing. It is not possible to anticipate every circumstance and cover it in this rulebook: therefore, common sense and a regard for fairness will be the fundamental principle in interpretation and enforcement of the rules by WERA officials. The individual WERA Official responsible for the matter concerned will be empowered to carry out the enforcement of these regulations and shall have the final voice at the scene (See Chapter Five for rider protest and appeal procedures). Any discussion of or suggestions regarding WERA rules should be submitted in writing to WERA. Suggestions will be reviewed for consideration by the WERA officials and technical advisors for possible inclusion in the next Rulebook. 1. Riders will be ranked according to ability and will be assigned “Mini”, “Provisional Novice”, “Novice” or “Expert” status. 2. Experts and Novices will be awarded points and awards separately unless noted in the class description. For example, the first Expert-ranked rider in a combined Expert/Novice race earns first-place Expert points and awards: the first Novice-ranked rider in a combined Expert/Novice race earns first-place Novice points and awards regardless of overall finishing position. 3. Novices finishing in the top 3 in any of their Sportsman classes at the Grand National Finals and/or in the top five in points in any class in any Region may be advanced to Expert status the following season. Novice riders not meeting the above criteria may apply for advancement to Expert status by submitting a written request to WERA Headquarters, which may or may not be allowed pending review of the rider’s performance and finishes by WERA Headquarters. Riders may decline advancement via writing or email to WERA Headquarters if they feel they are not ready to compete on the Expert level, and may or may not be allowed to retain Novice status pending review of the rider’s performance and finishes by WERA Headquarters. 4. A rider may apply to move down in status from Expert to Novice if: a) he has not competed for more than one year; or b) he is being beaten consistently by Novice riders. Riders may or may not be allowed to move down in status pending review of the rider’s performance and finishes by WERA Headquarters. 5. The WERA NATIONAL CHALLENGE SERIES shall consist of six to ten events at tracks across the country. The events will feature a points accumulating Championship Series for the WERA Superbike (Expert Only), Formula 2 (Expert and Novice), Open, 750, 600 and 300cc Superstock (Expert & Novice), 600 & 750 Superbike (Expert & Novice), Lightweight Twins SS (Expert & Novice), and Heavyweight Twins Superbike (Expert & Novice). The final National Challenge Series Championship event will be held at the Grand National Finals. Participation in WERA Sportsman Classes may also be available on WERA National Challenge Series weekends (see the WERA yearly schedule for more information). 6. WERA divides the country into geographic areas. Within each area a series of sprint races are held. The Sportsman/Vintage Regional Class Champion will be the racer with the highest point accumulation in their class at the end of the season in each region. The Sportsman National Class Champion shall be the rider who wins his/her class at the Grand National Finals. The Vintage National Champion will be the rider with the highest point accumulation in their class at the end of the year taking their 6 best finishes for the at any Vintage round throughout the year and adding it to their finsh at the GNF which will count for double points. 7. A group of long-distance races each lasting from four (4) to twenty-four (24) hours may held at tracks across the country is designated the WERA Endurance Series, which is described in detail in Chapter 10. 9. Only riders completing a minimum of 75% of a sprint race and taking the checkered flag at the start/finish line under power on the race track or pit lane will be awarded a finish position. 11. Trophies for National Challenge Series and Sportsman/Vintage Sprint Championship events will be awarded for first, second and third in each Novice and Expert class. All trophies should be collected at the track; if an unclaimed trophy is requested late, the rider must pay for shipping, C.O.D. Trophies will only be available for one month following the event. 12. WERA is again partnering with the AMA in 2018. All riders at all WERA races will be required to have an AMA Membership. You can obtain this ahead of time at http://www.amajoin.com/WEMORO or at the event through WERA. Use the promotional code WEMORO so they know you’re a WERA racer when you join or renew. 1. The RACE DIRECTOR designated by WERA is in overall control of a race event. All other officials report to the Race Director in their specific areas of responsibility. A rider may seek a ruling, on any matter concerning the race and the application of WERA rules, from the Race Director whose judgment will be final at that event. A rider wishing to appeal any decision made by the Race Director may use the procedures outlined in Chapter 5. 2. The ASSISTANT RACE DIRECTOR/SAFETY DIRECTOR reports to the Race Director. If a Race Director is unable to perform his duties during an event for any reason, the Assistant Race Director will assume the duties and responsibilities of the Race Director. 3. The STARTER reports to the Race Director and is responsible for starting and finishing races and for displaying appropriate flags, or lights, as specified in Chapter 4. 4. The GRID MARSHALS report to the Starter and are responsible for organizing pre-grid procedures and for ensuring that all riders are gridded according to the grid sheet. 5. The CHIEF TECHNICAL INSPECTOR reports to the Race Director and is responsible for ensuring that all machines are prepared properly as outlined in Chapter 8 and that each rider’s protective equipment and clothing is in good order. 6. The WERA TECHNICAL CONSULTING PANEL will be utilized by the Chief Technical Inspector or WERA National Technical Director. The WERA Technical Consulting Panel will be comprised of : WERA Race Director’s, WERA Chief Technical Inspector’s, and team mechanics. The WERA Technical Consulting Panel will assist in the decision making process regarding the legality of certain performance or safety modifications. Each situation brought before the panel will be voted upon by all panel members. This may occur during or after an event. 7. The CHIEF REGISTRAR/SCORER reports to the Race Director and is responsible for registration, timing, scoring and results. In races involving “race time” the Chief Registrar/Scorer will have charge of the official clock and will be the sole judge of time. 8. A rider may protest any action by a race official by submitting a verbal or written statement to the Race Director, who will make a final ruling on the scene. If the rider does not like the Race Director’s ruling, the rider may appeal the decision by following procedures listed in Chapter 5. The Race Director may at any time revoke the racing privileges of any racer, or have a team owner, team manager or crew member removed or barred from further events for acting improperly, being abusive, fighting, disobeying instructions or doing anything else to disrupt orderly procedures or affecting overall race operations or safety. 1. If a rider has pre entered an event and cannot make the event the rider will receive a full credit/refund minus a $20 handling fee. If a rider enters on Saturday morning and pays for Saturday and Sunday, then is disabled in Saturday morning practice, they are entitled to a 50% credit for Saturday and 100% for Sunday. Riders who enter on Saturday and are disabled in the events on Saturday and have paid for Sunday, they are entitled to a credit for 100% of their Sunday entry fees. If a rider enters Sundays races without racing on Saturday and is disabled in practice either Saturday or Sunday, they are entitled to a credit for 50% of their Sunday entry fees. If a rider is entered in more than 2 races on Sunday and is disabled in a race they are entitled to a credit for 50% of their remaining races. The only refunds given at the event will be for a rider who has not gone through, or cannot pass technical inspection. Any circumstance not listed above will result in a forfeit of fees. Lost credit memos will not be replaced. Credits are transferable and can be used for payment on anything made directly to WERA. WERA must be notified of a rider being disabled at the event where it occurs. WERA will not be able to go back and verify items following the event. All no show credits will be issued from WERA HQ. 2. a) An entry is defined as a specific rider/motorcycle combination. If a heat race or qualifying session has been run to determine grid positions, any change in that rider/motorcycle combination will result in that combination being placed at the back of the starting grid for the final event. This also applies to any rider found illegal for the heat race or qualifying session and has proven legality for the final. b) During a SPORTSMAN Sprint Championship weekend, grid positions will be determined by your current points standings (your place in points, not your points total) in the Region(s), if you have no points you will be gridded by order of registration. In the event of a crossover race (multiple regions or National/Sportsman combined races), you will be gridded in the furthest forward grid spot you have earned. In the event of tied grid spots the computer will designate them randomly. For round one in any region you will be gridded by your finishing position in the previous year then by entry order. c) During a National Challenge Series weekend grid positions will be determined by qualifying for certain classes or the current points standings in the National Challenge Series - check the event schedule for details. For Round One grids will be determined by your finish position in the previous year and then by order of registration. If grids are determind by qualifying sessions any rider not qualifying will be gridded randomly at the rear of the field. Any rider found illegal in qualifying will be placed of the back of the final grid. d) The grids for a combined Sportsman and National Challenge Event where the classes have been combined, if not determined by qualifying, will be determined as listed above for a crossover Sportsman event. 3. There are two basic procedures used for starting a race: a) A group or groups of machines may be separated on the grid by a multi row break and started simultaneously with one green flag/light. OR b) A group or groups of machines will be separated into two or more waves (these waves may also contain row breaks), these waves will be started with each wave getting a separate green flag/light. Waves will have a grid marshal with a wave board separating them on the grid. The method of start used will be determined by the Race Director and Chief Registrar. All riders will be notified at the Riders’ Meeting and/or on the grid sheets which races will contain wave starts. 4. Racers will be given a first, second and third call for each class over the track loudspeaker system and/or FM station. The first call will be made at the beginning of the previous race with the second call at the halfway point of the previous race and the third and final call at the checkered flag of the previous race. If riders are NOT in the pre-grid area by the third call, the class may NOT run. Calls may be sped up or lengthened as determined necessary by the officials. 5. Crew and family members are prohibited from access to the racing course for any purpose; a violation will result in a fine of no less than $100. Riders needing medical attention will be attended to by qualified, official race personnel. Disabled motorcycles may be retrieved ONLY with permission of the Starter and/or Race Director or via an approved vehicle. 6. If a SPRINT race is red flagged after half of the total distance has been run (half way being defined as the entire field on the lead lap has received the half way flags), officials may declare the race completed. In that case, riders shall be scored according to their position on the final lap that was completed by the entire field preceding the red flag. Any rider(s) not running on course at the time of the red flag, as well as any rider(s) deemed by officials to have caused the red flag will not be scored in the final Sprint results. In the event a race has been red flagged before reaching halfway the restart will be the remaining number of laps, not a complete restart. The original number of laps will be used to determine the halfway point of the race no matter how many laps have been completed or remain. 7. All events will run rain or shine unless the track is impassable or unsafe as determined by race officials. When an event is canceled by WERA the following may happen: The unrun races, their points and awards may be moved to another day/event/weekend and/or a 50% credit for unused entries will be issued from WERA Headquarters. Contingency awards may or may not be moved at the discretion of the contingency sponsor. 8. All travel on the racetrack and pit lane will be ONE-WAY, in one direction. Riders must not travel backwards on the race track unless instructed to do so by race officials. Violators will be fined, and/or penalized. 9. Any rider who runs off the track must reenter the course safely and without attempting to cut the course unless instructed to do so by an official or corner worker. If an advantage is gained, a rider will be subject to penalties of a stop and go penalty and/or loss of laps and/or disqualification and/or fines. If a rider cuts a chicane a time penalty may be assessed, the amount of time will be determined by the officials at the event. Officials may use video to verify cutting of the course among other methods. 10. In a sprint race crash the rider and machine MUST be examined by a corner worker if possible. Then the rider and machine must proceed directly to pit lane for a technical inspection by a WERA Tech Official prior to being scored for any additional laps or completing the race. Only after these inspections have been accomplished, may the rider reenter the race if the checkered flag is not displayed. If a corner worker is not at the exact crash site the rider and machine must proceed OFF TRACK to the nearest corner station for his and his machines examination. The machine in question must be re-teched in its entirety by a WERA Technical Inspector prior to the racer’s next race. 11. Weaving at any time to break the draft or prevent a pass, or reckless weaving for any purpose, will be penalized by a fine and/or disqualification or suspension. 12. Tear-offs are allowed in all series and must only be removed on straightaways. 13. Riders must enter the track at the pit exit/pit out. Riders must not use the pit in/pit entrance road to enter the track unless directed by officials. 14. Any competitor intending to pull off the track must signal their intentions and must never cut across the track in front of other riders. 15. Competitors having a lap time of 1.2 x or greater than a competitive lap time for their motorcycle or class (i.e. getting lapped in four or less laps), may, at the discretion of the officials, be removed from the track. 16. Burnouts, “lighting up” or spinning the rear tire in the pit, on pit lane or on the grid are not allowed. Offending riders may be penalized. 17. Wheelies in the pit or paddock area are not allowed. Offending riders will be penalized and or fined. Wheelies done on track in a manner that endangers other riders may cause the offending rider to be penalized. 18. It is the responsibility of each competitor to be aware of all information covered by the Rulebook, mid-season updates, as well as information covered at any Rider’s Meeting. 19. Riders may not protest other riders for infractions listed in Chapter Three, which are enforceable only at the observation and discretion of Race Officials. 20. WERA reserves the right to tear down any machine to check for class compliance. See Chapter 5. 21. WERA Right of Refusal-WERA reserves the right to refuse participation in an event, or the issuing of a Competition License to any person for whatever reason it deems appropriate. 22. Protests regarding machine legality, grid position, scoring discrepancies must be filed within 30 minutes of the posted grid or results for the protest to be accepted. a) All rights to advertising, promotion, filming, recording, exhibition, and other exploitation’s of the event, the participants and machines entered in the event, and their activities at the site of the event before, during, and after the event and reasonably related to the event, reserved to WERA and its assigns. b) Participants hereby grant WERA and its assigns (1) full and unconditional permission to make still or motion pictures and any other type(s) of audio or visual recordings of their and their machine’s participation in the event and their activities at the site of the event before, during, and after the event and reasonably related to the event; and (2) the exclusive, worldwide and perpetual rights to use the same, together with their names, likeness, and date of, or relating to, their entered machine(s) for publicity, advertising, exhibition or exploitation, whether or not for profit, in print, audio, video, or other distribution by any and all means now known or hereafter developed. c) Participants agree: (1) that, without the prior written consent of WERA, they shall not take any still or motion pictures or make any audio or visual recording of the event, participants therein, or activities at the site of the event for the use other than personal, in-home use of the participant, or cause or permit others to do so or to use the same; (2) that WERA shall have exclusive, worldwide, perpetual, and universal use of any pictures or recordings made or used in violation of this paragraph; and (3) that WERA shall be irreparably harmed by the making or use of such pictures or recordings in such fashion without such permission. d) Participants agree that, without the prior written consent of WERA, they shall not offer for sale, sell, give away, or otherwise distribute, at the site of the event, any tokens, any souvenir, and product, or thing of value, or permit others to do so, and that WERA shall be irreparably harmed by a violation of this paragraph. 24. Riders taking overt action to impede, harass or distract other riders on the track may, along with their Team, be disqualified, fined or suspended for up to two (2) years. If a rider’s actions as outlined above result in the injury of another rider or riders, the guilty rider may be suspended for any time period up to and including for all time, at the discretion of WERA. 25. All riders must submit a completed Technical Verification form to pass tech. This is mandatory even if you are not competing for any contingency monies/certificates. 26. WERA reserves the right to immediately impound and disassemble a machine at any time. 27. The speed limit off of the racing surface at all facilities (unless posted lower by the track) is 10 Miles Per Hour. This pertains to all vehicles! This covers the entire Pit, Paddock and access roads etc. 1. Meet all of the sponsor requirements (i.e. : product usage, placement of required decals/patches etc...). All available info and decals/patches will be available in registration or technical inspection. 2. Submit all required claim forms to registration or tech as often as noted on form. These forms must be filled out completely to receive awards. All forms must be turned in before the race. 3. Turn in a fully completed technical verification form when your motorcycle is taken through tech. All spaces on this form must be filled in. Incomplete forms will not be accepted and/or will not be processed for contingency monies. 4. Must go through a post race inspection if available. 5. Any issues with contingencies must be brought to the attention of the WERA office within 3 months following the event. Any issues after that cannot be resolved and the contingency monies will be forfeit. Incomplete or incorrect information will result in the contingency not being processed and cannot be corrected after the event. Contingency forms submitted to WERA after the event will not be processed. When the 2 Board is displayed racers not already taking a warm-up lap must stay on pit road until after the race has started and after the starting field has passed the pit exit. A motorcycle already on the starting grid which stalls while the 2 Board is displayed may be restarted and returned to the assigned grid position, as long as the 2 Board continues to be displayed. It is the riders responsibility to know all flagging positions and suggest any changes in position. These suggestions need to be made before racing begins to be considered for that day. WHITE with a RED CROSS: Ambulance on course, passing is allowed. All stations will display the Ambulance flag as the ambulance enters the course. As the ambulance travels around the course, the Ambulance flag will be displayed around the course, but will be waved by the corner station(s) preceding the ambulance. BLACK FLAG: The rider must complete the current lap and report immediately to the officials on pit lane. This flag may be used to indicate a jump start or other grid infraction as well as any other situation where the officials deem it necessary to have a rider brought in to inspect the riders machine or have a talk with the rider. In most cases, the offending rider’s number will be displayed on a board at start/finish. BLACK FLAG with an ORANGE DOT (Meatball Flag): Indicates a safety violation. The rider in question should as quickly and safely as possible, pull off of the racing surface and inspect his/her machine or report to the nearest corner station. Failure to respond may result in disqualification. In most cases, the offending rider’s number will be displayed on a board at start/finish. YELLOW FLAG: A) When held stationary-indicates a potentially dangerous situation near the track or a slower moving motorcycle. B) When waved vigorously-indicates a hazard or obstacle on the track, avoidance maneuvers may be necessary. Exercise extreme caution, slow your speed until past the situation. Passing for position under a waving yellow flag is NOT allowed and the offending rider will be assessed a penalty. See Chapter 5 under PENALTIES. YELLOW/RED STRIPED FLAG: Indicates debris or fluid on the track surface. The corner worker will attempt to point to the debris on the track. Also may be used folded into a triangle to point at riders who have an issue with their machine. If pointed at a rider they must pull off the racing surface as soon as safely possible and proceed to a corner station for further instruction. Should the protested machine prove to be illegal for the class in which it is being protested, or if the rider refuses teardown the protest fee will be reimbursed to the rider making the protest and the rider found illegal will be subject to disciplinary action as outlined. Any other performance or class related illegality discovered in the process of inspection will uphold the original protest. If the protest is denied, the protest fee shall become the property of the rider protested and found legal. The protested rider has the option of withdrawal from the protested race in lieu of a fine, with no points, prizes or entry refund. The rider may not enter the same class on that machine until legality has been proven to the satisfaction of WERA. 2. Protests shall be determined at the event at which they occur and the decision shall be at the discretion of the Chief Tech Inspector and Race Director. Protests unable to be determined at the event will go before the WERA Technical Consulting Panel and/or the WERA National Chief Technical Inspector. In the event a decision cannot be made at the track, the part(s) in question may be impounded by WERA for measurement and analysis. Riders will be given a receipt for such parts and will be guaranteed transport and return at WERA’s expense. 3. If a rider wishes to appeal any decision made by a Race Official, a written appeal must be sent to WERA Headquarters within five (5) days after the rider is notified of the decision. The appeal will then go through a two step process: a) All appeals will be reviewed by WERA for a ruling based on all information available to WERA. If the rider does not agree with the decision made by WERA then: b) A rider may request his/her appeal be reviewed by the appeals board. The board will be made up of 3 to 5 people inside and/or outside of the motorcycle racing industry chosen by WERA. WERA will contact the board and send all available information on the appeal via Fax, mail or other carrier (at WERA’s discretion as to which would be the most efficient). WERA will notify the rider of the boards’ decision as soon as all members have responded. If a rider wishes to make his/her appeal in front of the board (face to face), the rider will be responsible for the expense of bringing the board to WERA Headquarters in Canton, GA. The decision of the board will be final. Any rider attempting to contact and sway the decision of board members will automatically have the appeal denied. The protesting rider is not allowed to appeal a decision made by either WERA or the appeals board. WERA reserves the right to decline to convene an appeals board if there is no need in WERA’s opinion. WERA also reserves to right to overrule an appeals board decision, the final decision on all issues rests with the WERA President. Failure to submit an appeal in writing within five (5) days after notification will result in the decision being upheld. 4. When a protest is made, the burden of proof is with the protested rider and/or team. Failure to furnish the Technical Inspector with proof of convincing evidence/witnesses as to the legality of the machine will result in the automatic upholding of the protest. 5. If a protest cannot be decided at the time of the event, the awards, points and prizes for that class may be held pursuant to the decision of WERA. 6. Protests can only be made by a rider in the same class, same status, as the protested rider. In an endurance race any team may be protested by another in the event. Participants in the protest are limited to 1 designated representative of the protesting rider/team, no more than 2 representatives of the protested rider/team (i.e. the rider and a mechanic) and WERA Officials. No other rider/team, mechanic, spectator etc. will be allowed input into or viewing of a teardown unless approved by WERA. When a machine protest is upheld, the protested rider may not lodge a counter-protest, or other protest against any other area or person in his class at that event. 7. Unsafe and unsportsmanlike riding techniques should be reported to a WERA Official. At the discretion of the Race Director or WERA President, a rider found guilty of unsafe or unsportsmanlike riding techniques will be fined, and/or disqualified from the race, and/or suspended, and/or asked to forfeit their Competition License. 8. The purpose of the rules is to run an orderly, competitive and fair race, emphasizing safety of all involved. The rules are not intended to allow a racer to defeat another with the rulebook, rather than on the track. The rules are not intended to allow one racer to harass another. All protests must be made in writing and the person filing the protest must be prepared to identify themselves to the rider protested. Protests deemed capricious may be denied. In the event this rule, which states the overall purpose and principles of the WERA Rulebook somehow is interpreted to conflict with another rule or statement, this rule shall prevail in its literal sense. 9. Chapter 3 rules regarding Race Procedures (and certain other rules as noted in the rule itself as printed in this rulebook) are enforceable by race Officials only, must be observed by Officials, and cannot be protested by other riders. a) Loss of event points, purse and available contingencies at the event. b) Loss of points for the season up to the time of infraction. c) Suspension of WERA Competition License. If a fine and suspension are both levied, the suspension will begin on the date the fine is received at WERA Headquarters. d) Permanent loss of WERA Competition License. e) Monetary fines. Contingency forms will not be processed until any and all fines are paid. Any points earned during the event in which the infraction occurs will be withheld until all fines are paid. Fines not paid at the event must be paid by cashier’s check or money order to WERA Headquarters and must be received within 5 business days of the event. IF THE FINE IS NOT PAID WITHIN THE FIVE DAY PERIOD THE RIDER WILL BE DISQUALIFIED FROM THE RACE/EVENT WHERE THE FINE WAS LEVIED. A Rider will not be allowed to compete in any subsequent WERA events until the fine has been paid. If a fine and suspension are both levied, the suspension will begin on the date the fine is received at WERA Headquarters. f) Jumping the start: A minimum of two WERA Officials must call a jumped start. In a heat race a one-lap penalty will be assessed. In a sprint final, or an endurance race, the offending rider or team will be notified via a meatball flag at start/finish signifying they have been assessed a stop and go penalty. The meatball flag will be shown until the starter is satisfied the rider has had ample opportunity to see it. If the officials This is strictly at the discretion of the officials and is not a protestable issue. Should the offending rider or team fail to comply with the stop and go penalty within two laps of being notified, the rider or team will be penalized one lap in the final official result or given a time penalty as determined by the officials. Definition of a jumped start: Any movement after the 1 board has been displayed and prior to the Green Flag or Light. g) Passing under a waving yellow: A WERA Official or corner worker must report a pass for position under a waving yellow. In a heat race a one-lap penalty will be assessed. In a sprint final the offending rider will be penalized five positions in the final official result, and/or be assessed a fine, and/or disqualified. In an endurance race the offending team will be penalized one lap in the final official result, and/or be assessed a fine, and/or disqualified. The no passing for position zone is defined as: from the location of the waved flag until past the incident or incidents. h) Grid Infractions: (including but not limited to: assuming the wrong grid position, tire burnouts, etc.) At the discretion of the WERA Officials the offending rider may be assessed a stop and go or time penalty and/or fine. i) Pit Stop Infractions: (National Endurance Series) At the discretion of the WERA Officials, a team may be brought into the pits for a stop and go penalty (the length of which will be determined by the severity of the infraction) for any pit stop infractions. The team may also be fined or otherwise penalized. j) Unsafe riding under red flag conditions will be assessed a fine, and/or disqualified. In an endurance race the offending team may be penalized one lap in the final official result, and/or be assessed a fine, and/or disqualified. Unsafe riding may include but is not limited to wheelies, riding too fast, passing other riders, and weaving. k) Any rider causing a red flag due to not having either the oil drain or oil filter safety wired will be fined no less than $100 at the discretion of the Race Director and Chief Technical Inspector. A second offense will result in suspension of the riders’ license for a minimum of 6 months. 1. All machines must carry three sets of numbers, one on the front and one on each side. Numbers must be a minimum of 6” high, be spaced 1/2” apart and allow 1/2” of unobstructed number plate/background border - this means an entire solid background, not just outlining the numbers. Side number plate/background fields must be behind the rider on the machine’s tail section or on the lowers on the side of the machine - they must be visible when the rider is in position on the machine. If the side numbers are displayed on the lowers they must have a 1/8” minimum black line around the plate area outside of the required 1/2” of numberplate background. Single numbers on the top of the tail are allowed ONLY if the rider has numbers on each side of the lower as well. Numbers must be the rider’s correct WERA competition number and the only time a rider may change his competition number is when he/she is renewing his/her Competition License. Machines not meeting number plate requirements will not pass technical inspection and/or will not be scored when racing. If you are found to have illegible numbers you may not race again until they are correct. Front numbers may be off center so long as they are still clearly readable by the corner workers and officials. 2. Numbers will be assigned from 2 to 999 by Region; due to the number of licensed WERA racers, a racer in one Region may be assigned the same number as a rider in another Region. If two riders with the same number from different Regions enter the same race, the rider racing out of his Region may be instructed by a race Registration official to alter his number for that race. At the National Challenge events, the National Challenge participant’s number will take precedence. Once a number is assigned in a Region, that number will remain assigned to the rider until the expiration date printed on his Competition License. A rider has 30 days after the expiration date to renew his license and maintain his same competition number. 3. EXPERT riders must use white numberplates with black numbers. Current year MotoAmerica number plate colors may be used in Expert classes. Expert Champions will be entitled to wear a #1 plate in their championship class the following year. Novice Champions will be allowed to run a RED #1 on a white plate in the corresponding expert class their Rookie Expert season. NOVICE and PROVISIONAL NOVICE riders must use yellow numberplates with black numbers, fluorescent yellow is preferable. 4. Endurance Teams are allowed to run any color combination numbers and plates so long as they are contrasting colors. Endurance machines being run in sprint races must conform to the rules as listed above. 5. On all numberplates the number “1” must be a straight line (no serif). The only exception to this is if the rider is running only the number “1”, then there are no limitations other than legibility. 1. All participants and spectators acknowledge that racing is dangerous and accept the inherent risks, including serious injury or death. 2. Have a current, valid WERA Competition License or other racing license designated as valid at a particular race. Only WERA Licensed riders will earn points toward an invitation to the Grand National Finals. WERA will allow racers with the following current licenses to participate in two WERA events before said racer is required to purchase a WERA membership: CMRA, CVMA, RACE, WMRRA, OMRRA, CRA, USCRA, VRRA and AHRMA. Riders who participate in WERA events with another race organization’s license ARE NOT EARNING WERA POINTS. Points are only awarded to racers with a current WERA License. Contingency awards are only available to racers with a current WERA license. 4. All riders must evaluate each facility for conditions and other matters related to their individual safety. All entrants and other race personnel must rely on their own judgment and assume all risks of participation in competition or working in competition in any manner. All riders and other participants are strongly urged to carry comprehensive medical insurance to supplement event coverage. Attendance at the Riders’ Meeting is MANDATORY. 5. Any competitor annoying or harassing an Official, infringing on the rights of other competitors or conducting themselves in any sort of unbecoming manner as determined by WERA officials may be disqualified, suspended, fined or all three. 6. Any rider under the age of 18 may not compete without the duly notarized consent of parents or legal guardian. The notarized consent will be retained by WERA. In addition, each rider under the age of 18 must have on file with WERA a minor release form which can be obtained from WERA. Some facilities may require this form every weekend, the forms will be available at registration. Rider 8 years old may ride in practice only with the mini’s. Riders 9 years old are limited to 50cc & 80cc classes. Riders 10 years old are restricted to F/E/D/Clubman class machines. Riders 12 & 13 years old are restricted to 650cc/LW Twins machines. Riders 14 & 15 years old are limited to “C” class machinery. Riders 16 and older are allowed to run any WERA legal machinery. These limits may be changed at WERA’s discretion on a case by case basis. 7. Any person within the confines of the race track whether in the spectator, pit or paddock areas must posses valid event passes at all times. Those found without a valid pass may be removed from the property. These passes are to be obtained from an approved ticket vendor/seller and any fraudulent use of a pass by any person will result in penalties being levied against them and/or the rider they are with. Persons with fraudulent passes may also be prosecuted to the fullest extent of the law. 8. Any person found consuming or under the influence of a substance that could create an abnormal state of mind shall be removed from and refused admittance to all restricted areas of the event premises at the discretion of the Officials. Any rider under these conditions will be immediately disqualified from the event in progress and is subject to suspension, fines and criminal prosecution. The Rider is responsible for their crew’s actions and will be penalized for their behavior. 9. All Race Personnel, Officials, Riders, Mechanics and Photographers are required to display the proper credentials and passes. a) All WERA competitors must wear helmets which have a Snell ’00 thru ‘15 approval sticker, or must be BSI or ECE approved and must be in good condition (as determined by Tech) and not manufactured more than 5 years prior to the date of the event. Helmets must be taken to Technical Inspection and must display a WERA Helmet Tech decal prior to being allowed on the track. Open-faced, modular, and dirt bike helmets are not allowed. b) Footwear must be no less than 8 inches in height and must be leather. Gloves must be worn, and while leather is preferred, combinations of nylon and leather are acceptable, if leather protects the fingers and palms. Gloves and boots must be of a fit so there is no gap between them and the leathers. c) Clothing must be leather. All suits must be a one-piece garment for racing. Separate jackets and trousers are acceptable only if they zip together around the entirety of the waist to make one piece of clothing, pending approval of the Technical Inspector. d) It is required that riders wear back protectors under their leather racing gear unless their racing gear is equipped with a back protector. Chest protectors are suggested. In general, riders are encouraged to use any and all available protective material which does not restrict safe operation of their machine. e) A rider must bring for Technical Inspection their machine and helmet every event. Also riders may be required to bring leathers, boots and gloves as directed by tech. A Tech sticker must be displayed on the machine and rider’s helmet. f) WERA Patches will be available at Tech and must be worn on leathers to be eligible for WERA purse monies including Solo payouts. a) Resume: A resume or display of another organization’s current roadracing competition license may be accepted as proof of ability, and the new licensee may participate in that weekend’s events. b) Successfully completing a WERA approved rider’s school. WERA recognizes most racing schools across the United States, contact the school or WERA to be sure. The length of time between taking the riders’ school and racing must not exceed twelve (12) months. c) Any former WERA Novice racer, who has not been in active competition for a period of two years, will be reinstated with Novice status and it is recommended that they attend a WERA New Riders’ School; if more than three years the school may be required. A racer who became inactive while an Expert and wishes to renew at an Expert Status after 2 years may be required to have an evaluation at their first event. 13. All Provisional Novice Riders must wear a contrasting colored shirt over their leathers. Upon graduation from Rider’s School, the rider must complete two separate events before qualifying for a Novice Status License. Under a Provisional Novice License, a rider may race Sportsman events but not a National Challenge Series event (unless combined with Sportsman classes). Endurance/National Endurance events will be done a case by case basis. The Ed Bargy Racing School counts as one event for Provisional Novice riders. 14. All Entries must be signed in ink by the rider prior to Technical Inspection. Under no circumstances may a person other than the rider sign the entry form. Failure to comply with this regulation may result in the rider being disqualified, suspended and/or fined. 15. Loan of a Competition License to another person will result in suspension from one year to a permanent suspension and a fine of no less than $500.00 to the License holder. 16. Children under the age of 10 must be attended to at all time by a responsible adult. Pets must be on a leash at all times. Children under 14, unless a licensed participant, and pets are prohibited from the hot-pit lane at all times. Track requirements may differ and will supercede this rule. 17. Consumption of alcohol and possession of open alcoholic containers by any person holding a rider or crew pass or anyone having any effect on a racebike (spectator’s are exempt pending track regulations) is prohibited in the pit and paddock area during a race event, this means while any racing is going on even if you are done for the day. A rider is responsible for their crews’ actions and will be penalized for their behavior. 18. No one may enter the track without proper credentials, registering, executing a Release and passing WERA Technical Inspection. Any WERA licensed rider who rides during any practice session without properly being registered, or rides in a class for which he/she is not registered, shall be subject to disqualification and/or suspension and/or a fine, and/or probation. Any non-licensed person who rides on the track will be ejected from the premises and denied future entry and WERA License privileges for a three-year period and shall be subject to legal action. Any WERA Licensed rider who permits or allows any person to ride his/her machine in violation of this section shall be subject to disqualification from the event and/or loss of entry fees and any contingencies won during the event, and/or suspension and/or a fine of no less than $500. 19. Pit bikes must have a number plate bearing the competition number of the rider (or endurance team) to whom it belongs and must be operated responsibly including but not limited to speed limits, wheelies, etc. Pit bikes that are not licensed for the street must not exceed 100cc in displacement. No one under the age of 14 may operate a motorized pit bike. Failure to follow these rules will result in impounding of the pit bike until the owner leaves the premises. 20. It is unlawful to physically abuse any party at any WERA event. Guilty parties will be prosecuted to the fullest extent of the law. Guilty WERA License holders may additionally be fined at least $500 and placed on probation for no less than one year. Non-licensed participants (crewmembers, scorers, guests etc.) are the responsibility of the WERA Licensee with whom they are associated and said Licensee may suffer punitive action taken by WERA officials. 21. Non-English speaking riders must provide an interpreter. 22. The V.I.N. of racing machines may be spot-checked during the season. Any rider participating on a stolen machine will be subject to full prosecution under law and may also suffer a permanent loss of his/her WERA Competition License. 23. WERA provides excess ONLY type medical insurance coverage for all participants at all WERA events. There is a deductible assessed per incident. It is the rider’s responsibility to supply their own primary medical insurance coverage. Some facilities have rules and regulations in addition to those listed above. In such cases the track rules must be followed by all. In the event that a series sponsor requires a decal to be run to qualify for contingency or purse, WERA reserves the right to apply said decal anywhere on a participants machine. Every racebike must be ready to race when it is brought to technical inspection. All machines participating in WERA events, or events hosted by WERA affiliates, must prominently display the WERA decal (meaning the entire 4” circle) on both sides of their machine. Points and awards may be withheld from any racer who fails to display the WERA decals. 1. By participating in the event, the rider implies complete willingness to conform to WERA rules. Passing Technical Inspection does not give a racebike immunity from protest; if the Technical Inspector does not notice an illegal modification or a failure to conform to WERA requirements, the rider is still responsible for the racebike meeting WERA requirements; be it their own or borrowed. The Technical Inspector must inspect and pass every machine before it will be allowed on the track. The Technical Inspector will reject any racebike that does not meet WERA requirements. The Chief Technical Inspector may, at any time, re-inspect any racebike and revoke approval if the machine no longer meets WERA requirements. The Technical Inspector may at his discretion allow a “Temporary Fix” for a particular race weekend. Any rider who takes his or her racebike onto the racecourse when the racebike does not meet WERA requirements will be assessed a penalty for each infraction. The rider or his crew are required to point out any problems or potential problems with their racebike. A rider or his crew will be allowed to make a safety-related fix at an event in order to participate at that event, provided the fix is not an illegal performance modification (at the discretion of the Chief Technical Inspector for that event). The rider must provide the damaged or broken part(s) along with a written request to the Chief WERA Technical Inspector of the meet and receive approval for said fix. This allowance will be limited to that event only and the correct part(s) must be installed prior to the next event. 2. All racebikes must meet WERA requirements. A racebike will not pass Technical Inspection and will not be marked with a Tech Sticker until the racebike is in complete compliance and the rider has completed and submitted his Contingency Tech Verification Form. If any of the items to be inspected are hidden from view by bodywork, those sections of bodywork must be removed prior to arrival at technical inspection. Oil retaining lowers must be removed priot to arrival at tech inspection. *may be secured by silicone glue or weather-strip adhesive in lieu of wiring. a1)Substantial gauge “R” type spring clips may be used in certain applications but must be wired to the machine. 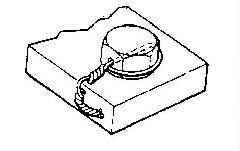 Tab washers designed to accept safety wire may be used. Safety pin style clips may be used on most items but NOT on oil drains or oil filters or any fluid lines/fluid holding bolts. a2)A catch can shall be fitted where required or at the direction of a Technical Inspector. a3)Kawasakis wth a stock oil filter clamp must use an additional hose clamp. b) Fuel lines and any other fluid carrying lines must be clamped (using hose clamps) or secured by some other appropriate means. c) Water cooled engines may use plain water, or water with Redline (or similar product, call WERA for verification) cooling system rust and corrosion inhibitor at 0.5 ounces per quart of plain water concentration, Silkolene Pro CCA (Corrosion Control Additive) and Royal Purple Purple Ice are also allowed. Glycol based antifreezes are prohibited. d) All pre 2001 Suzuki GSX-Rs must have engine case guards installed around the right and left sides of the engine, extending beyond the frame, and are subject to the WERA Technical Inspector’s approval. Case guards on the left side of 1995-97 Kawasaki ZX6R’s are suggested but not required. Yamaha FZR 400, FZR600 and YZF600 machines must have an engine case guard on the right side of the engine. Heavy-duty aluminum replacement covers may be used in lieu of case guards. Stock case covers with extra metal welded on to make them thicker may also be used. 06/07 Yamaha R6’s must used a tank guard of some sort on the sections that extend past the frame rail on either side.. The guard must be approved by tech. e) Only one engine at a time may be used. f) Only gasoline may be used as a racebike fuel. Nothing may be added to the gasoline except commercially available, approved octane boosters and lubricating oils. No oxygen or nitrogen bearing additives (i.e. : NOS) in any Superbike or Superstock based class. g) All racebikes must have an operating and marked engine kill switch on the handlebars. Dead man tethers are allowed and are suggested. h) All racebikes must have a self-closing throttle and operating front and rear brakes. 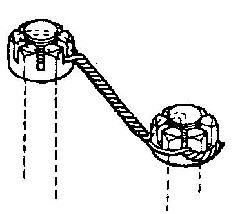 i) Kick-start levers are allowed to remain on the machine however they must be secured to keep them from swinging out. j) Glass and plastic lenses must be taped. Clear tape may not be used. k) Side and center stands must be removed. l) A steering damper is MANDATORY on all machines and must be mounted in a safe and workmanlike manner. The damper must not overly limit the amount of stock lock-to-lock handlebar travel. m) The license plate and bracket(s) must be removed. n) Items are deemed safe only if secured in a visible, approved manner. Aircraft nuts, locknuts, Locktite or similar compound is not acceptable. o) The seat or fender must extend toward the rear, past a line drawn vertically through the rear axle. p) The rider, in position, must be fully visible from the side and top. Transparent material may not be used to circumvent this rule. No streamlining may be attached to the rider or helmet. q) The machine must be clean. r) Tires must be in good condition as determined by the technical Inspector. No off road knobby tires may be used in any class. No recapped or retreaded tires may be used in any class unless they have been manufactured by a D.O.T. approved facility in compliance with CFR 571 and are tested using Laser Shearography during the manufacturing process. Glued, pre-cured retreads are not allowed. s) Tire valve caps must be used and should be metal or hard plastic. t) If speedometer and tach cables (not wires) are installed, they must be safety wired. u) Sidecovers that “snap-on” must be removed, wired, taped or bolted in place. v) All race machines must use muffling devices that limit the sound to 105dBA. The noise level will be measured while the machine is on the track during practice sessions and racing events. A static test may be used off track to measure the noise level by holding the dB meter at 48 inches and at a 45 degree angle from the exhaust opening(s). The engine will be steady at 1/2 of redline during this test. If a machine measures over the limit with either test it will not be allowed to participate in any further events during the weekend until it has been brought under compliance. Riders may also be fined or otherwise penalized for non compliance. Certain race tracks may require lower limits and at these tracks those sound limits will be enforced and noted on race entry information. w) Glass headlight covers must be removed. Plastic may be taped over or removed. x) Clutch and Brake levers must have at least a 1/2” ball on the end. y) Handlebar ends must have either: (1) end-plugs; (2) be solid; or (3) stock bar-ends must be retained. Handlebar ends may not be hollow or ground to a sharp edge. z)All machines are required to have a lower fairing capable of holding 5 quarts of liquid. Machines not equipped with a lower fairing from the manufacturer may have a custom piece fitted. Any machine which has a newer or OEM “race” model may use the newer models fairing to comply with this rule (i.e. the TL1000S may use the lowers from a TL1000R). In Superstock classes lowers must be OEM spec with any necessary holes filled in. Lowers must be attached in a manner approved by tech. aa) All machines must have a sticker placed on the triple clamp or gas tank reading “GP” or “STD” depending on the shift pattern used by your machine. These stickers will be available at tech. bb) Brake pad retaining pins must be secured in a visible manner such as an R Clip or safety wire, silicone is acceptable but not preferred. 3. All riders/teams must use an AMB Tran-X 260/MyLaps Bike or or X2 transponder for scoring purposes in all series. The transponder must be mounted vertically on the left front fork leg in a manner so that the numbers are readable. Do not mount the transponder horizontally in the front fairing - the signal strength drops to an unacceptable level and you may not be scored every lap. Any laps missed due to an improperly mounted transponder will NOT be reinstated. It is the riders responsibility to make sure their transponder is on the bike and functioning properly during qualifying and racing. If a transponder is verified to be mounted and is not functioning during a race the rider will be allowed to choose between a disqualification or a $50 fine. If the transponder is not on the machine or the rider cannot prove a verified working transponder was on the machine the choice is a $100 fine or disqualification. WERA will have the scoring system running during practice and will print lap times to allow riders to verify their transponder is working. WERA will have transponders for rent. Rental fees will be $60 for the event, any transponder not returned to WERA at the event will result in a $100 fine. Any transponder not returned to the WERA office within one week after the event and lost transponders will result in the rider/team being charged the going rate for a new transponder. This charge will not be refunded. Transponders cannot be used by more than one rider per any given weekend. CATEGORY refers to the general type of motorcycle. There are three major categories; Superstock, Superbike and Formula (Grand Prix). CLASS generally refers to a grouping based on engine size within a category. CHANGE means the addition of aftermarket or “optional” parts or accessories designed to increase safety, performance, and reliability or reduce costs. ALTERED or MODIFIED means cutting, grinding, milling, porting, boring, drilling, bending, welding, brazing or soldering other than normally accepted maintenance and repair procedures. OEM is defined as Original Equipment from the Manufacturer. OEM type is defined as aftermarket equipment manufactured to all original specifications in dimension and design. REMOVED is defined as unbolted - not cut off. PERFORMANCE INDEX occurs when a motorcycle is demonstrably faster or slower than others in its displacement group, and may, at the discretion of WERA, be assigned to another class. 2. Canadian models unless exactly the same as U.S. year/models must run their Superbike Class. 3. All machines must conform to the Technical Inspection Requirements of Chapter 8. 4. SUPERSTOCK: There must be at least 1000 motorcycles available to riders, worldwide, per year and the machine must be generally available on the U.S. market with full EPA and DOT approval to qualify a machine for the Superstock categories. Proof of eligibility must be provided by the rider. Superstock machines are defined original motorcycle manufacturers’ equipment intended for use on public roads which are allowed to use an aftermarket or racing exhaust system instead of the stock exhaust system and other modifications as listed below. The decision regarding the legality of any machine entered in a Superstock class is the responsibility of the Chief Technical Inspector for the event in progress. The rider or sponsor of any machine is responsible for producing a service or owner’s manual with all part numbers, specifications and other material required to prove its legality. Legality will be determined based upon manufacturers’ specifications (or comparison of similar OEM parts) for the year, model and make of the machine entered. a) Grab rails, horns, reflectors and outer rear fender, and helmet locks may be removed. b) Turn signals, cruiser pegs, and luggage racks must be removed. c) Passenger footpegs and brackets may be removed. d) Rider footpegs and brackets may be changed or modified. e) Handlebars may be changed or altered. f) Instruments, instrument brackets, switches, and associated cables may be removed and/or replaced by aftermarket parts. Original combination instrument/fairing brackets may be replaced with aftermarket parts. This applies and is limited to the upper front fairing area. g) Headlight and tail/brake light housings may be removed. Disconnection must be made at stock connectors. If requested the stock fixture/bulb must be operable, with no modifications, by simply plugging the fixture/bulb into the wiring harness or socket. h) Exact replica replacement bodywork (this includes the tailsection) may be used on machines equipped with bodywork from the factory. If the stock bodywork includes air-ducting tubes they may be removed. If they are utilized they must be stock or exact replica parts. Solo seat cowlings may be added when not supplied by OEM. If an aftermarket tailsection is used that incorporates a solo seat cowling when one is not offered by the manufacturer, the tailsection must conform to the shape and size of the stock bodywork that is provided by the manufacturer. The solo seat cowling portion of said bodywork must start at the position of the stock bodywork on the rear and rise to no more than 1.5 inches above the seat when measured from the top of the bodywork to the top of the seat on a stock motorcycle. The shape of the bodywork must conform to the shape of the seat (no huge rises in the middle etc.). A “Superbike Seat” is allowed (i.e. the seat is molded into the tailsection). Tinted windscreens are allowed, Any windscreen may be used. 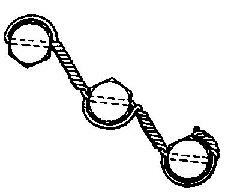 i) Suspension: Rear shocks may be changed or modified but must remain the same type as original. Fork springs may be replaced with aftermarket springs, and fork oil may be changed. Stock internal parts of forks may be changed to alter damping characteristics. To allow external adjustment of fork springs, fork caps may be changed. Suzuki TL models are allowed to use aftermarket linkages that allow for mounting of standard style shock’s replacing the stock rotary valve setup. j) Slicks are allowed in all classes. DOT tires are allowed in all classes. Rain tires are allowed in all classes but must not be modified from the molded design. k) Chain and/or sprockets may be changed. Chain size may be changed. Shaft drive machines may change gear ratios. The chain guard may be removed. Machines originally equipped with a drive belt may change to a chain drive system. l) Steel braided or Kevlar brake lines may be used. Brake pads may be changed. Rear rotors may be modified however must still remain functional. Front rotors may be replaced but the replacement must be the stock rotor for that machine or 100% the exact same as the stock rotor including material. m) Carburetor jets and needles may be changed. Aftermarket jet kits may be used. Resizing of air metering holes in CV carburetor slides is allowed. Aftermarket carburetor heat shields are not allowed. n) The OEM air box must be used and an OEM type filter must be properly installed (a K&N style direct replacement filter is an acceptable OEM type). The only modification allowed is the sealing of airbox drains. Filters may be changed. OEM type must be used. If the filter acts as part of the airbox housing the replacement filter must not have a larger opening than stock. o) If the crankcase ventilation hose is relocated from the airbox it must be routed to a catch can and the stock airbox hole must be plugged. p) Spark plugs may be changed to aftermarket parts. q) Clutch may be changed to a slipper clutch. Clutch fiber and metal plates may be changed to aftermarket. Clutch Springs may be changed. r) Cam timing is allowed via the slotting of cam sprockets. Press on cam sprockets may be changed to OEM spec bolt style. Ignition timing may be altered by slotting the ignition trigger mounting plate or by replacing the stock ignition rotor with an aftermarket rotor. s) 1mm Overbores are no longer allowed on any machine manufactured after 1995 (model year 1996 and up) unless offered by the manufacturer as a maintenance item. Aftermarket non-OEM valve seats are not allowed. Head and base gaskets may be replaced with aftermarket parts and do not need to be to stock spec. Aftermarket gaskets may be utilized on engine parts. Multi-angle or radius valve jobs are allowed as normal maintenance as long as machining is confined to the actual valve seat insert and does not extend into the port or combustion chamber. Valve seat to port blending is not allowed. Valves must meet OEM specifications. t) No bead blasting (or blasting using any other medium) is allowed on any internal engine part except gasket surfaces. u) Machining of gasket surfaces of cylinder head(s), cylinders, and engine cases is allowed through 2015 models. 2016 and newer models are allowed surface machining of the cylinder head gasket surface only. All internal and external engine parts must remain stock without modifications, no addition or removal of metal is allowed, except as mentioned in this chapter. No surface treatments are allowed. Engine must remain at stock displacement except as outlined in above. v) The transmission must use the stock OEM parts for that model. Shifter return or detent springs may be replaced with aftermarket springs. w) 49-state model engine and ignition components may replace those same components on California-only model machines of same brand, year, and model. x) Cooling fan assemblies may be disconnected and/or removed on water-cooled machines. Disconnection must be made at stock connectors. y) You may use captive wheel spacers and replace the speedometer drive with a spacer. z) Aftermarket screw off type gas caps are allowed so long as they do not increase the orifice size compared to the stock cap. aa)Stand studs or hooks may be added to the swingarm, stand studs that do not require welding (or gluing etc.) or cutting may be added to the front forks. bb) You may use alternative bodywork fasteners (i.e. DZUS fasteners). cc) You may replace the ECU/Black Box with any aftermarket unit or modify to any extent the stock unit. dd) You may replace the subframe with an aftermarket subframe. It must be the same overall dimension as the stock subframe (i.e. no removal of the passenger portion). You may polish or paint the frame and/or swingarm. ee) You may replace the exhaust system with an aftermarket system. Pipe wrap is allowed. ff) Manual cam chain tensioners are allowed. gg) Electric ignition cutout shift devices are allowed, however they may not physically move any portion of the shift mechanism. hh) Machines running wire-spoke wheels stock may change to a non wire-spoke wheels so long as the replacement weighs as much or more than the stock wheel and is the exact same diameter and width. SV650 is allowed to change to a 5.5” stock rim from a GSXR600 or Honda F2/F3/F4 in all classes. ii) Kit wiring harnesses from the OEM for the machine may be used in place of the stock wiring harness. Aftermarket harnesses or home made harnesses are not allowed. Stock harnesses may not be modified in any way other than as listed above. Aftermarket batteries of any size are allowed. Charging system MUST remain stock. The items above constitute the entire realm of deviation from showroom stock for Superstock classes. If it does not mention you CAN do it, you CAN NOT. a) In Superbike the original combination of frame and motor must be maintained except in the case of similar models with directly interchangeable engines. Single cylinder machines may use any engine, frame, and fairing combination. b) 2 stroke GP machines will not be allowed to participate in Superbike (based) classes unless otherwise noted. 6. FORMULA 1, FORMULA 2, FORMULA 3 and CLUBMAN (or any subsection of a class that specifies “Formula Rules”) Have no restrictions other than displacement, fuel limits as outlined in Chapter 8, and configuration as outlined below. * 250cc GP machines are allowed in B Superbike. Ducati 1098 and Buell 1125R (and CR) are allowed into B Superbike in Superstock trim. *Aprilia Tuono up to 2010, KTM SuperDuke 990, Honda VTR1000F and Suzuki V1000 are allowed in C Superstock and Superbike in Superstock trim only for both classes slicks are allowed in Superbike. *The TZR250 is allowed in D Superbike only and must conform to Superstock rules with no limits on bodywork. The VF500 is allowed in D Superbike only with stock displacement. *There will be no bodywork or tire limitations in D Superstock. D Superstock bikes do not need to have DOT approval. FZR400’s may run 17” wheels. *There will be no bodywork or tire limitations in E Superstock. E Superstock bikes do not need to have DOT approval. *All bikes may upgrade to 17” wheels so long as they do not weigh less than the stock wheels for that model. *Kickstand mounts may be cut off of frame. *Buell Firebolt and Lightning, Harley-Davidson XR1200 (AMA Spec class limits in SS & SB), Ducati 900SS and any model using the 1000DS or 1100DS engine are allowed under Superstock rules in LWTSB only. *There are no bodywork limits in LWT. *There are no bodywork limits in HWT. *Honda Hawks and Air cooled Ducati 750’s, 250cc 2-stroke GP replica machines (TZR, NSR, RGV, etc..), Aprilia Cup, and Triumph Thruxton, are allowed but limited to Superstock mods, no Ducati Supermono. 250cc GP machines are not allowed. Up to B Superbike and A Superbike machinery. Up to C Superbike & Formula 2 machinery. 9. A racer may ride up classes, but this will be on a space available basis. If the race grid is too large the last riders registered will be refunded their entry fee. a) Superstock machines may ride up two categories only, C to B and A.
b) Superbike machines may ride up two categories only, D to C and B; C to B and F-1. c) Formula machines may ride up ONE category ONLY: 125cc Grand Prix and Clubman to Formula 2; Formula 2 to Formula 1; National Challenge Series classes: Formula 2 to Formula 1. 10. Turbocharged machines MUST ride up one displacement class. 11. We will be holding races for 50 and 80cc machines at certain East Coast tracks & all WERA West rounds - we will try to inform everyone via the web site at www.wera.com if there are any additions to this limited schedule. b) All machines and riders must conform to the rules as set forth in this rulebook. Exceptions may be made for technical/equipment requirements on a case by case basis. 2. All points scored by a Team during an endurance season are owned by the registered Team Owner. The registered Team Owner can also be a rider, but does not have to be a rider. 3. A Team Captain must be named by the Team Owner. The registered Team Owner can also be the Team Captain, but does not have to be the Team Captain. The Team Captain can also be a Team Rider, but does not have to be a Team Rider. The Team Captain must be present at all races entered by the Team during the season. The Team Owner may replace the Team Captain once during the endurance season under normal circumstances. In the event a Team Captain is also a Team Rider and is injured, or special circumstances exist preventing the Team Captain from attending an endurance event, the Team Owner may petition the WERA President for special consideration allowing temporary or permanent replacement of the Team Captain even if such replacement will exceed the one-time-only rule applicable under normal circumstances. The decision to allow or not allow special consideration is solely at the discretion of the WERA President. 4. A Team can have no more than five (5) Team Riders during an endurance season. In the event a Team Rider is injured or becomes unable to compete, the Team Owner may petition the WERA President for special consideration allowing that rider to be replaced temporarily or permanently by one other rider, even if such replacement causes the Team to exceed the five-riders-only rule. Any rider who is injured and replaced temporarily can only be replaced by one rider for as long as he/she is out; a rider cannot be replaced by several different riders at different events. Upon the injured rider’s return to the Team’s Roster, the replacement can be dropped from the Team’s Roster. In the event a team consistently fields two entries, their roster will allow six (6) riders provided the same roster is shared by both teams. 5. For each 24-hour endurance event, a Team may add an additional two (2) riders for a total of seven (7) riders. The two additional riders will not constitute part of the Team, except in the 24-hour event. During any Endurance event a rider may take a normal shift of no more than two consecutive hours, after which he/she must remain off the machine for at least 30 consecutive minutes. In the event of a red flag, the downtime will not count against the rider’s two hour limit. If the red flag is in excess of 30 minutes the same rider may remount and continue for a two hour period. Any team exceeding the 2 hour limit will have any laps after the 2 hour mark removed from their results and may be penalized further as outlined in Chapter 5. Once an endurance event has started, no additional riders will be allowed to sign up and join a team already contesting the event unless a rider’s co-rider is injured or otherwise incapacitated during the race. The team or rider may ask the Race Director for special permission for the rider to finish the race or allow another rider to sign the team’s entry form to replace the injured rider and complete the event. The emergency replacement rider for that event will not be counted as a member of the Team’s Roster. The Race Director will consider all factors in making their decision, including weather conditions, number of hours already ridden by the rider, number of hours remaining in the event and condition of the rider. The purpose of this rule is to prevent one rider from riding an entire endurance event or almost an entire endurance event purely for team’s competitive advantage (because the co-rider or co-riders are slower). The purpose of this rule is not to prevent a team with only two riders from finishing competitively if one of those two riders is legitimately injured or incapacitated. A Team can not be a single rider in races longer than two (2) hours and riders attempting to enter endurance events longer than two (2) hours for the purposes of practice only will not be allowed. If it becomes obvious during an event that a rider is only using an event longer than two (2) hours for practice or has no co-rider, that rider will be black flagged, disqualified and removed from the event at the discretion of the Race Director or WERA President. 6. A Team may use three motorcycle frames during an endurance season under normal circumstances. Frame numbers must be given on each entry form and must be verified at tech inspection. In the event an unregistered frame is used, points scored will not be counted towards the Team’s total. If, during an endurance series event, a team destroys or damages beyond safe repair the three frames allowed under normal circumstances, the Team Owner may petition the WERA President for special consideration allowing use of additional frames. Petition for special consideration must be accompanied by proof of crash destruction or damage and the frame in question must have been inspected by a WERA tech official immediately following the crash which caused the damage or destruction. The decision to allow or not allow a Team to use additional frames under special consideration lies solely with the WERA President. When a Team changes class, the overall points shall carry forward, but the class points shall not. A Team will be allowed three frame numbers for the new class they are then running. Any “parts bike” in the pit area during an endurance event must not be a rolling chassis and cannot have number plates matching any entered team (fairing with number plates should be removed). A non-race prepared (i.e. not safety wired or stripped for racing) street machine may be kept in the paddock area. 8. Endurance racebike technical and safety requirements are the same as those for sprint machines with the exceptions listed below. Since more track time is involved, compliance to these regulations is critical. However, it is the intention of WERA to encourage innovation in endurance racebike serviceability and safety. Quick release systems will be allowed or not by WERA based on overall system integrity under race conditions. Requests for approval of quick-release systems must be submitted in writing to WERA with sketches or photographs as needed to clearly explain the system in question. Until WERA has allowed a quick-change system, all machines must conform to the letter of the rules in Chapter 8, especially in terms of safety wiring requirements. In the interest of costs, all tire changing stands shall be the normal lever type stands with no mechanical, air or hydraulic stands allowed - however, as noted above, WERA does encourage innovation and may approve such a stand for use depending on cost for the teams and availability. 9. Endurance races will be conducted as outlined in Chapter 3 of this Rulebook. a) Headlight lenses and bulbs may be removed in all classes except in races running into hours of darkness. Glass headlight lenses at races running into hours of darkness must be taped or covered by plastic covers during daylight hours. Headlights must be uncovered or untaped and lights must be turned on at the Team’s last pit stop before sunset. The event’s Race Director will instruct teams of the time window for mandatory light illumination at the Riders’ Meeting. Any team not conforming to the light rules will be instructed to bring their bike in to correct the problem, if the team can’t accomplish this or can’t be contacted then the bike will be brought in by the officials. b) Any reasonable lighting system will be allowed in races running into hours of darkness, but must be approved by the Chief Technical Inspector at the race in question. All lighting and wiring must be fitted in a safe and workmanlike manner. All headlights must be pointed in a forward direction. Cornering lights may be angled outward in a forward direction. c) Rear lighting is required in hours of darkness. A minimum of two Cyalume light sticks or other self-lighting products are acceptable as long as they are bright enough in the opinion of the Chief Technical Inspector. Reflectors alone are not acceptable. Taillight lenses must be taped during hours of daylight. The tape may be removed at the last pit stop before sundown and must be replaced at the first pit stop after daybreak. Clear packing tape is recommended for taillights in endurance events running into darkness only. d) Brake lights must be disconnected at all times. 11. Numberplates may be of any color so long as the numbers are a contrasting color. Numbers can be of any style.. Front numberplates are optional during the hours of darkness. No lights will be allowed on the side of a machine that may be distracting to other riders. Side numberplates may be illuminated providing such illumination is performed in a workmanlike manner and is approved by the Chief Technical Inspector. 12. All entered racebikes must be on the pit lane 10 minutes prior to the start of the race. Unless otherwise stated in the riders meeting. 13. Grid positions will be determined by previous season finish or current overall point standings in the endurance series. Any teams not having points will be gridded by order of entry and behind teams following the series. 14. Crashed machines must undergo technical inspection prior to continuing in the event. If a Team does not bring a crashed machine to the Technical Inspector before continuing in the race, the Team will lose all laps subsequent to the crash until the machine is reinspected and may be fined and/or disqualified from that event entirely, at the sole discretion of the WERA Officials. A crash truck will retrieve disabled equipment in order of occurrence or in order of necessity as determined by race control. 15. Pit lane (hot pit) is restricted to Teams actually involved in making a pit stop or signaling a rider on the track, or to photographers and journalists credentialed by WERA. Pit stops may involve a maximum of four (4) people not including the rider(s) If a rider does anything to aid in the pitstop they count against the four (4) people. In the event an independent tire company representative is inspecting tire wear on a machine during a pit stop, but is not otherwise involved in the pit stop, that independent tire company representative will not be counted against a Team’s maximum of four (4) people. Signals to riders may be given by only two crewmembers at a time unless the Race Director decides that having more than one person running a pit signal board is not a hazard and is not creating any problems. Teams violating provisions of this rule will be subject to a penalty. 16. All crewmembers over the wall must be wearing shoes, long trousers and a shirt (no tank tops, cropped shirts, or Under Armour type material allowed unless otherwise instructed during the riders meeting. This does not include the person(s) signaling the riders. The crew members operating the fuel can and the fire extinguisher must be wearing all cotton clothing with long sleeves or fire retardent clothing. They must be wearing fire retardent footwear or leather footwear. The footwear should not be vented in any way. Nomex type fire resistant/proof gloves/sleeves are recommended. 17. No support vehicles will be allowed in the cold pit area. This includes trailers. 18. Right of way during pit stops is to the rider entering the pits from the track. A racer leaving the pits must yield to racers on the track. 19. No machines may reenter the course once the checkered flag has been displayed. 20. Each team must identify their pit area on the front and rear with their competition number affixed to an 8” x 10” numberplate to allow officials to quickly locate them. Numbers can not be affixed by tape to a pit wall, but must be hung on the Team’s pit canopy. If a team has no canopy they must affix the numberplate as directed by the race officials. 21. Each team must have at least one 10-pound conventional fire extinguisher or two five-pound fire extinguishers in their pit at all time. In both cases they must be fully charged. Any team found without an operational fire extinguisher will be penalized. Anyone sharing a fire extinguisher with another team must notify race officials before the start of the race to keep from being fined. If your fire extinguisher gets used during a race contact a race official for help in obtaining temporary replacement. 23. No smoking, campfires or gas-type lanterns or stoves will be allowed in the hot pits (may also include cold pit area at the track or WERA discretion). 24. Only routine service and minor crash damage repair will be allowed on the hot pit road. Major rebuilding or repair must be done behind pit wall in the cold pits. A Team must notify race officials when moving their racebike behind the pit wall. 25. A Team may change engines, wheels, tires or other components after the official endurance clock begins counting race time. A team may only change one frame during a race. If a team chooses to enter a second frame they then totally forfeit anything earned with their first frame. All previous hourly results will be stricken from the computer and cannot be retrieved. This holds true even if the first frames results would have been better than what the team accumulated on the second frame. A team MUST notify WERA scoring personnel before entering the track on a new machine failure to do so will result in a loss of laps and/or fines and/or disqualification. 26. A racebike must be able to pass technical inspection at any time during the race. Failure to pass technical inspection may result in lost laps, fines and/or disqualification from that event. Noise requirements outlined in Chapter 8, must be conformed to at all times. Machines not meeting those requirements may be pulled off the track at any time during a race or practice session. 27. Pit Marshals will be on duty to enforce rules. Endurance pit stop rules are enforceable by Pit Marshals and violations must be observed by Pit Marshals; pit stop violations cannot be protested by riders or teams and will be governed under Chapter 5, Protest Procedures. 28. A properly registered Team with a machine that has passed technical inspection may enter a race at any point after the start, with laps counted from point of entry. 29. It is strongly suggested that each Team must provide its own scoring personnel however it is not mandatory. 30. All Team members, riders, scorers, crew members, guests, visitors, relatives, etc... are the responsibility of the Team Owner and punitive actions warranted by their behavior may be directed toward the Team and Team Owner as well as the individual in question. 31. All prizes, points and awards are the property of the Team Owner. The Team Owner may distribute prizes and awards won during the season at their discretion, but points, series standings or year end awards which carry into the next season (i.e. free entry for Class Winners; Show Money, etc.) may not be sold, given or transferred to another Team or party for the following season’s endurance events. New Teams carrying another Team’s name solely to claim awards must be prepared to prove consistent Team ownership to the satisfaction of the WERA President and will be allowed to claim awards solely at the discretion of the WERA President. a) Class points will equal the team’s class position points (from the chart below), added to team’s mileage points. b) Overall points will equal the team’s overall position points (from the chart below), added to a team’s mileage points. c) Mileage points will be computed on the basis of laps completed x length of the track divided by 10. In the case of a 24 hour race, mileage points will be calculated as above except they will be divided by 20. 33. Reservation of a grid space for National Endurance Series events via pre-entry is highly recommended. A Team holding a grid position will forfeit that grid position and their deposit if they are not at registration by 9:00 am the day of the endurance event, and their grid position will be given to a Team on the waiting list. The top fifteen (15) Teams in overall point standings going into each round shall have a grid position held for them until 9:00 am the day of the endurance event. If an endurance round is included at the WERA Grand National Final, a team must have participated in one prior round to be eligible for a grid position. a) All scoring will cease. When the red flag falls scoring will be backed up to the race leader’s last completed lap prior to the red flag, and all subsequent lap completion times will be dropped. b) The clock will not be stopped, but will run continuously until the endurance time has been reached or the race has been declared complete by the Race Director. c) The grid for the restart shall be based on the standings at the time of the red flag as determined by the transponder scoring system. A first, second and third call to the pre-grid shall be given and the five board starting procedure will be followed. On a restart, the 5 board will be given from pit lane, the bikes will not be put on the track for a pre grid. The first lap to be scored shall be the first time machines cross the S/F line after the restart, any laps recorded during the red flag period shall not be counted as a scored lap. If a red flag situation is encountered towards the end of the race, the race will only be restarted if control gives a “clear track” with 30 minutes or more remaining on the event clock. d) You may not service, fuel, adjust or repair an endurance machine during a red flag. All work must cease on any machine in the pits at the time of the red flag. Any team who does not comply with this may be fined no less than $50 and may be docked laps depending on the severity of the infraction. Machines on the track at the time of the red flag will proceed onto pit lane and park directly across from their pit. When the rider comes in due to a red flag - one crewmember is allowed across pit lane with the stand, more than one crewmember will result in fines. As soon as the bike is on the stand the rider and crewmember must immediately cross back to the other side of pit lane. You may put a cover over the bike (one crewmember - not at same time as the stand crewmember - if you need help ask an official). NO ONE (other than a race official) may touch any machine during the red flag other than to assist the unloading of a crashed bike from the crash truck or at the direction of an official, any bike brought in will be dropped either in the teams pit or across pit lane at the discretion of the officials. Tire reps are permitted to examine the tires of the machines across pit lane. When first call is given for the restart one crew member and the rider (you may switch riders) are allowed to cross to the machine and remove the stand/start the bike. If you need more than one crewmember to push start your machine - put a starter on it. All machines that were running on the track at the time of the red flag must take the restart. You do not have to take the warm up lap. You do not have to take your grid spot (you can start from the back of the field or pit lane). If you do no take the start you will be penalized one lap. Work on the bikes may begin/resume when the first green flag has been given for the restart. Teams may prepare for this by having fuel cans, parts, tools etc. waiting (this includes prepping or stripping the “B” bike) but cannot touch the machine until the flag is thrown. Any violation of this rule must be witnessed by an official for a penalty to be levied, WERA may use a video camera for surveillance of the pit area. The validity of the videotape will be determined by WERA officials. 35. A Team’s last counted lap will be the last lap the Team is able to complete during the time frame of the endurance event. (i.e. last possible time to record in a 4-hour would be 3:59:59, in a 6-hour - 5:59:59 in a 24-hour- 23:59:59). When the checkered flag is displayed at start-finish the event is complete and no times are to be recorded. 36. The purpose of these rules is to run an orderly, competitive and fair National Endurance Series emphasizing safety of all involved. The rules are not intended to allow one racer or Team to defeat another with the Rulebook rather than on the race track. The rules are not intended to allow one racer or Team to harass another in anonymity. All protests must be in writing and all protest filers must be prepared to be identified to the protested person or Team. Protests deemed capricious or found to involve something that would not reasonably be expected to affect the actual race outcome or cause safety problems may be denied, or assessed with a fine, rather than a penalty. In the event this rule, which states the overall purpose and principles of the National Endurance Series rules, somehow is interpreted to conflict with another rule or statement of policy, this rule shall prevail in its literal sense. The final decision on all protests lies with the WERA President. Vintage races will be run at all WERA Sportsman Series rounds. Certain classes will only be run at the AMA Vintage Motorcycle Days at Mid-Ohio. Those classes are noted by “VMD Only” after the class name. Those classes will NOT be paying regional or national points. Machines are eligible to “bump-up” to a second class. Certain machines may be eligible to bump-up to a third class if they meet all eligibility requirements for each class entered. Bump-up eligibility is as follows: 350 GP to 500 GP; 500GP to V1. 350 and 500 GP machines may be entered in Formula 500, or an appropriate Vintage class; Formula 500 to V 3. Formula 2 Stroke to V 5; V 1 to V 2; V 2 to Formula 500; V2 2-stroke to V3; V 3 to V 4; V 4 to V 5; V 5 to V 6; V 6 to V 7; V5 2-stroke to Formula 2-stroke; V7HW to V8HW, V7MW to V8MW & V8HW. WERA Vintage has four classifications of racing machines: “Heritage”, “GP”, “Formula”, and “Vintage” - V1 through V 8. Many machines will fit into more than one classification, either as the primary class or as the bump-up class. “Heritage” - Period design forks, caburetors. Steel frame of period design, no Norton featherbed frames. Overbore up to 0.080” is allowed. Gearbox must be OEM and no more than 4 speeds. Brakes must be drum and no large than 8.75” diameter and 1.75” width. No fairings permitted. Maximum wheel diameter of 16”. Must use spoke wheels. Maximum tire width of 130mm. No slicks allowed. “GP” - These classes are for older factory “purpose built” racers and street machines which may be built up with any “of the period” GP, engine, transmission and frame modifications. “Formula” – Are Vintage classes which allow machines comprised of mixed origin or composition which were in use prior to the class cut-off date. “Vintage” - The Vintage classes are passed on “production’ street machines. “GP” and “Formula” classes are allowed to “bump up” into certain Vintage 1 thru 7 classes. Factory “purpose built” machines must enter the next higher displacement Vintage class, i.e;, 500GP into V3 (750cc) class, H-D XRTT 750 must enter V4 (1,000cc) class, etc. Performance indexing of machines from a different era or displacement category may happen to help grow grids and add to the competition level of a class. Any machine in the eligible machines listing with “(SS Spec)” after it must conform to the Superstock Specifications as listed in Chapter 9. Pre 1951 Side Valve up to 750cc Must conform to AMA Class C rules of the era. Hand and Foot shift will be scored separately. 250cc machines limited to a 30mm carburetor and wet clutch. Among the eligible 250 GP machines are the following: Aermacchi/H-D 250cc 4 stroke, Allstate 250, Bridgestone 175cc 2 stroke, BSA/Triumph 250cc, Bultaco 125/175/200/250cc (round cylinder air cooled only); Ducati 100/250cc, Honda - all pre 1969 singles and twins up to 250cc and all CB175/CB200 twins regardless of year; Ossa 250; Puch 125/175cc. Pre 1970 2 stroke twins up to 250cc. Pre 1968 4 stroke twins up to 350cc. Pre 1969 4 stroke singles up to 350cc. Pre 1979 factory road racers up to 125cc. Honda 350cc twins with the following limitations: OEM Honda twin frame and swingarm (frame per Superbike rules, swingarm must remain stock), all other items must remain per Superstock rules except the following: any ignition system and coils, aftermarket cam chain and/or tensioners, any internal expanding drum brakes, any diameter period forks to class maximum diameter, any period body work/fairing, starter and charging system may be removed, wiring harness may be modified and airbox may be removed. Among the eligible 350 GP machines are the following: Aermacchi/H-D 350cc 4-stroke singles; AJS 7R 4-speed; BSA 350, BSA 441; Bultaco 125/200 TSS; Ducati 350; Honda 305 Superhawk, CR-77 and the restricted 350cc twins listed above; Norton 350; Royal Enfield 500cc singles any year; Suzuki X-6, T-250;Yamaha TD1, B, C, and DS7(up to 3mm over) without carb restrictions. Pre 1973 2 stroke singles up to 360cc. Pre 1973 2 stroke twins up to 250cc. Pre 1973 OHC up to 360cc. Among the eligible V1 machines are the following: Honda, all 4-stroke two cylinder street models up to 350cc and XL250/350s; Honda CB 360 regardless of year; Kawasaki 350cc single and S1; Suzuki and Yamaha 250cc street twins. Pre 1974 2-stroke singles up to 500cc. Pre 1973 2-stroke twins and triples up to 350cc. Pre 1974 push-rod up to 600cc. Pre 1974 OHC to 450cc. Pre 1974 4-cylinder up to 350cc. Pre 1974 4-stroke side-valve up to 750cc. Among the eligible V2 machines are the following: BMW R60; Honda CB350 with big bore kits and CB 450 with 500cc kits, CB400F any year, FT500 Ascot (82/83 model year); Kawasaki S2 350; Triumph 650 destroked to 600cc; Suzuki T350, GT 380; Yamaha R5, RD 250 (up to 3mm over), RD 350 (engine modifications permitted, 28mm carb body can be bored to 29.3mm), RD400 (Engine limited to SS Spec with OEM or aftermarket air filter including removal of airbox, front fender not required, racing tailsection allowed, removal of sidestand lug and other tabs on frame allowed, modification of wiring harness allowed), TD2, TD2B, and TD3, SR500, TX/XS500. Hejira round tube frame with 250cc 2-stroke Can-Am single is also allowed. Pre 1973 2-stroke factory road racers up to 360cc. Pre 1974 2-stroke production machines up to 500cc. Pre 1974 4-stroke, 4 cylinder up to 500cc. Among the eligible Formula 500 machines are the following: Bridgestone 350; Cagiva-Ducati 500cc Panta twins; Honda CB350F, 400F, 500F, CB450 and 500 twins, CB550 and 1977 MT125; Kasawaki H1, H1R, and S3 400cc; Moto-Guzzi 500 twin; Suzuki 500 Titan, GT 380, GT550, and GS450 any year up to 550cc; Yamaha RD350, RD400 (regardless of year), R5, SR500s (up to 540cc), TR2, TR3, TZ 250 and 350 (twin shock, no “G” model cylinders). TZ 750 cylinder and head (model 409 only) may also be used. The use of cast wheels is allowed in this class. This is a Vintage Formula class where hybrids up to 1985 are permitted. Alloy race frame of the perimeter type may be used as these were available in the period, but twin spar (“Delta Box”) frames are prohibited. Among the eligible Formula 2-Stroke machines are the following: Honda RS 125 (steel frame only); Kawasaki H2, H2R; Suzuki RG250, RG500 and GT750; Yamaha RZ350 (up to 450cc), RZ500, TZ250, TZ350, TZ500. Specialty frames, such as Harris, Nikko-Baker and Spondon, are permitted. The following classes will run at all WERA Sportsman events along with modern classes - Sportsman Double Headers will also be Vintage Double Headers. Pre 1965 2 & 4 stroke up to 500cc. Pre 1971 2 stroke singles up to 360cc. Pre 1965 side valve up to 750cc. Pre 1972 BSA, Norton and Triumph 650’s with restrictions: Original OEM frame, swingarm, motor, 4 speed transmission, 35mm forks , and 30mm carburetors. Among the eligible 500 GP machines are the following: AJS 7R 5 and 6 speed; BMW R50, R60/5 (stock displacement); BSA 441 and 500 singles and twins, 650 (production based) twins; Bultaco 250cc and 360cc singles (round cylinder only); Ducati 450; H-D and Indian side valve 750’s; Kawasaki 350 Big Horn; Matchless G50; Norton 500’s including Manx and 650 (production based) twins; Triumph 500 and 650 (production based twins); Yamaha DS7, RT series, MX 360, DT360. In all GP classes, the chassis/brake/bodywork must be of a type actually available prior to 1972. All five and six speed racing transmissions are allowed except in 650cc pushrod twins. Pre 1974 2-stroke up to 500cc. Pre 1974 4-stroke push-rod up to 750cc (3 cylinders max). Pre 1974 OHC up to 750cc. Iron barreled H-D Sportsters up to 883cc (+.060” overbore). Among the eligible V3 machines are the following: BMW R75/6; BSA/Triumph 650 and 750cc models; Ducati 750, 750SS; Honda 550F, 750F; Moto-Guzzi 750; Norton 650 and 750cc models; Yamaha XS650 regardless of year. Pre 1982 Twins/Triples up to 1000cc. Pre 1979 SOHC up to 840cc. Pre 1982 Air cooled, 4-stroke OHC multi cylinders up to 570cc. Twin shock only, twin piston opposed Lockheed style calipers permitted. Among the eligible V4 machines are the following: BMW R100 regardless of year; Pre-1974 BSA/Triumph with big bore kits; Pre 1988 Cagiva/Ducati 650cc Desmo types and Ducati 900SS bevel drive; H-D Sportsters up to 1000cc including Evo models; Pre-1974 Honda CB 750 overbored to 840cc and Rickman single cam; Honda Ascot/GB singles up to 600cc regardless of year. Kawasaki GPZ550 and KZ 550 (both up to 3mm over); Moto-Guzzi small block V Twins regardless of year and pre-1974 Moto-Guzzi 1000; Norton 850; Suzuki GS 450 and GS 550; Yamaha SRX 600 regardless of year and Seca 550. Pre 1983 2-stroke factory road racers up to 500cc. Pre 1983 Production based 2-stroke up to 750cc. Pre 1983 4-stroke push rod unlimited displacement. Pre 1983 OHC Twins to 1200cc. Pre 1983 OHC 2 valves per cylinder to 1200cc. Pre 1983 OHC 4 valves per cylinder to 1025cc. Among the eligible V5 machines are the following: Ducati F1A and F1B, 750cc limit; Honda CB750F, CBX, CB900F, pre-1986 Honda VF500, VF700, and VF750; Kawasaki KZ750, KZ1000, Z1, GPZ 550/750/1100, EX500, and EX250 without restrictions and regardless of year; Suzuki GS1000, Seeley Suzuki 750, pre-1986 Suzuki GS 750 (no hybrids, i.e., Suzuki GS 1000 motor in a 1985 mono-shock frame), GS 500 (no restrictions); Yamaha FZ600, Seca 550, Seca 750, Virago 980, TZ 750. RZ 350 with maximum displacement of 450cc. Pre 1990 Factory road racers up to 750cc. Pre 1990 OHC 2 valves per cylinder up to 1216cc. Pre 1990 OHC 4 valves per cylinder up to 1216cc. Pre 1990 OHC 5 valves per cylinder up to 1100cc. Among the eligible V6 Heavy Weight machines are the following: Honda Interceptor VF700/VF750/VF1000F and R, CBR600/750/1000, CB1100F, RS250 up to 1990; Kawasaki Ninja 600/750/900, ZX7/ZX10; Suzuki GS 1100F, Katana 1000/1100, GSX-R 750/1100 except 1989 GSX-R 1100; Yamaha FJ1100/1200 and Seca 900, FZR 750/1000 except 1989 FZR 1000, FZR600 (regardless of year), TZ750 alloy frame and mono-shock, TZ 250 up to 1990. Pre 1990 Air Cooled multi’s up to 600cc. Pre 1990 Air Cooled twins up to 750cc. Pre 1990 Air Cooled pushrod twins up to 1000cc. Pre 1990 Liquid Cooled twins up to 650cc. Pre 1990 Air Cooled 2-stroke multis up to 750cc. Among the eligible V6 Light Weight machines are the following: Ducati 750SS (non-FI models); Harley-Davidson 883cc Sportster (any year); Honda NT650GT (any year), VFR 400, NSR 250, NSR125 (any year); Kawasaki EX 500 (any year); Suzuki GS 500 (any year), RGV 250; Yamaha FZR 400 (any year), FZ 600, RZ 350 (up to 450cc), TZR (in Superstock trim). Pre 1996 Unlimited displacement production machines. Pre 1996 Factory GP machines up to 500cc. RS and TZ 250’s through 1999. Pre 1996 4-stroke multi cylinder up to 650cc. Pre 1996 4-stroke air cooled twins up to 1200cc. Pre 1996 4-stroke water cooled twins up to 800cc. All Honda CBR600F3 regardless of year, Kawasaki ZX6R up to 1997, Ducati 748 up to 2000 in Superstock trim other than tires and rims, Buells - steel frames, no FI bikes, all years, stock displacement. Exclusions: No machine eligible for D Superbike, 125GP, or Clubman classes will be allowed to bump-up to V 7. Machines based on A Superbike rules that are 12 years old or older based on the current season year as well as the exact same model of a newer year but unchanged in every way other than graphics. Machines based on C Superbike rules that are 12 years old or older based on the current season year as well as the exact same model of a newer year but unchanged in every way other than graphics. Major components are the engine and frame. Successive year models of the marque are eligible provided that major components are essentially unaltered (like design). Hybrids (a motorcycle comprised of mixed origin or composition) are permitted, provided that the design and operating principle was in use prior to the cutoff date. We will allow specific modifications, as appropriate, for disabled riders on a case by case basis, considering bike and class specifications, i.e. use of air shifters for disabled riders in superbike spec classes. Updating and backdating is permitted within the category dates. Components of later date may be used provided the design and operating principles of the component is essentially unaltered. V 6 Light Weight machines may run any hybrid engine/frame combination as long as the engine meets the year cutoff. V 6 Heavy Weight machines must run the stock frame. All V 6 machines must use period front end and wheels. All V 6 machines may use six piston brake calipers and may use modernized bodywork with integral belly pan. No newer machines may be run regardless of similarity to a bike that is age-legal for the class unless specifically listed in the eligible machines list above. V 7 machines must run the stock frame. Modernized bodywork may be used to incorporate a required belly pan. V7 machines are run per Superbike rules in Chapter 9. Suspension: Forks: All machines must use period type forks. Maximum diameter is: GP, V 1, V 2, Formula 500 and V 3 - 38mm. V 4, V 5 and Formula 2 Stroke –43mm. V 6 and V 7 – 45mm max. Upside Down forks are permitted in Formula 2 Stroke, V 5, V 6 and V 7 only. In WERA Vintage racing there are two types of rear suspension allowed: One with two shock/spring units inclined no more than 45 degrees from vertical and the bottom shock mount not more than 4 inches from the center of the rear axle. The other type is mono-shock or cantilever rear suspensions. Mounting two or more shocks on a mono-shock type suspension is not allowed. In GP, V 1, V 2, Formula 500, V 3 and V 4 mono-shock rear suspension is not allowed. In Formula 2 Stroke, V 5, V 6 and V 7 mono-shock suspension is allowed. Brakes: 350 & 500 GP will employ internal expanding drum brakes front and rear regardless of original equipment. Formula 500, V1, V2 and V3 will employ expanding drum brakes or disc brakes up to 12” in diameter, no floating rotors. Calipers may be a maximum of two pistons and may float (all components must be period correct). Formula 2 Stroke, V 4, V 5, V 6 and V 7 may use any brake system provided that the design and operating principle was in use prior to the cut-off date. V 6 and V 7 are the only classes allowed to run six piston calipers. Wheel Types: GP, V 1 will use wire spoke built-up wheels. V2 and V3 will use wire spoke built-up or cast wheels if they were OEM equipment on the production bike. Formula 500 may use cast wheels. Formula 2 Stroke, V 4, V 5, V 6 and V 7 may use any wheel type provided that the design and operating principle was in use prior to the cut-off date. Wheel Sizes: GP, V 1, V 2, Formula 500 and V 3 rim diameter will be 18” or greater unless original equipment was fitted with smaller rim diameter. Formula 2 Stroke, V 4, V 5, V 6 and V 7 rim diameter will be 16” or greater. Rim Width: GP, V 1 and V 2 may not exceed 2.75. Formula 500 and V 3 may not exceed 3”. Formula 2 Stroke, V 4, V 5, V 6, and V 7 may not exceed 3.5” front and 5.5” rear. Tires will be in accordance with WERA Technical requirements as set forth in Chapter 8. GP, V 1, V 2, Formula RD, Formula 500 and V 3 cannot use racing slicks or racing rain tires. Formula 2 Stroke, V 4, V 5, V 6 and V 7 may use racing slicks or racing rain tires. Engine: Aspiration will be natural. Make and model of carburetor is unrestricted provided that the design and operating principle was in use prior to the cutoff date. Internal engine components may be modified, altered or changed as per Chapter 9. Cylinders may be bored to a maximum of .080” singles, .060” twins, and .040” three and more cylinders from the class limit. No turbo charging or supercharging are permitted in any vintage racing machine. Any machine with a dispalcement limit following it in the class rules cannot use these overbores, the listed displacement is absolute. If there is no class limit then stock bore is the limit. Frame: Swing-arm bracing or use of aftermarket performance swing-arms is allowed in all classes unless denied by special rules. These modifications must be made in a manner considered period for the class; i.e., all V 4 OHC 4 cylinder machines may employ bracing or swing-arms of the design that was in use prior to 1982. Bodywork: Full fairings of period design are allowed in all classes but not required (unless noted elsewhere). Dustbin fairings are not allowed. No brackets or bodywork shall be made of Carbon Fiber or Kevlar except in V6 and V7. Carbon Fiber silencers are allowed on 2-strokes. Proof of eligibility: Eligibility documentation must be furnished upon request by the entrant. The following are evidence of proof: original magazine articles from the period, factory racing bulletins, manufacturer’s affidavit, historic journals or publications and other dated material. Replicas must conform to the original historic configuration in major components. (Major components are frame, engine and transmission.) Original publications are required, photocopied articles/documents are not acceptable. If the motorcycle that you would like to race is not listed under “Among the eligible machines…” eligibility muct be confirmed with WERA for approval prior to racing the machine. Cutoff date: In the class structure, eligible motorcycles are listed by date. For example, Pre-1974; this means that motorcycles built prior to 12/31/73 are legal within the structure of that class. V 6 and V 7 cut off dates will be the model year only. Formula and factory racers must have been raced at least once in the United States prior to the cutoff date. If a production street model motorcycle is built up to manufacturer road racer specifications it shall be considered a production road racer and shall compete in the next class up. A motorcycle will be considered to built to factory road race specifications if it employs any of the following: dry clutch; factory race cylinders or plated bore cylinders with no iron sleeve; factory or aftermarket racing head. Purpose built factory GP machines (Norton Manx, AJS 7R, G50, XRTT 750, etc) must also compete in the next class up if they enter a production based class, i.e. V 1, V 2 or V 3. 1. Press persons who represent a specific motorcycle publication and possess credentials from the publication may apply for WERA Press Membership from WERA Headquarters, free of charge. Supplementary fees may be charged at certain events required by the individual promoter or organizer. 2. Free-lance journalists and photographers may obtain Press Passes for specific events only after submitting a written request to WERA Headquarters. The request must be accompanied by examples of work published in a motorcycle publication or local newspaper. Requests must be received by WERA Headquarters at least one week prior to the event to be covered. Any photographer selling photos at a WERA event will be required to pay a vendor fee. WERA shall retain all rights to photos taken at any WERA event and may use them for any purpose. 3. All press persons must present a WERA Press Membership Card or other press authorization at Registration, pay appropriate fees, if any, and sign a Release and obtain a Gate Pass before they will be allowed on course. 4. All press persons shall be subject to the directions of the WERA Race Staff and Corner Marshals during the event. Failure to comply will result in removal of press privileges for that individual. 5. All press persons shall conduct themselves in a manner which preserves the safety of participating riders and themselves. This includes no crossing of the race track during the event, no standing within 10 feet of the race course or in the line of sight of riders on course and remaining behind track barriers or on the inside of all turns, as directed. 6. A Press Pass must be visibly displayed at all times. 7. All press/media persons are subject to the rules set forth in Chapter 3, as well as all other rules in this rulebook. 8. All photographers will be required to sign a contract with WERA stating what the responsibilities and rights of each party are. The following illustrations demonstrate some of the most common and effective methods for safety wiring your motorcycle. You should always use stainless steel aircraft type safety wire and proper safety wire pliers. All of these items can be found through many of the advertisers in this rulebook. 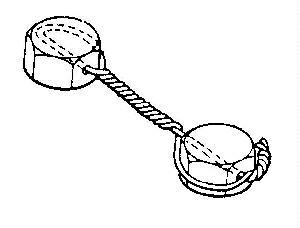 Make sure the wire is tight and pulls the bolt/nut clockwise as if it is still tightening. A good rule of thumb on what to wire is if it has a copper washer then usually is has a pressurized fluid behind it and need to be wired. The actual list of items is in Chapter 8. Remember that you can always ask one of the WERA Officials to look your machine over at any time to make sure it will pass tech.